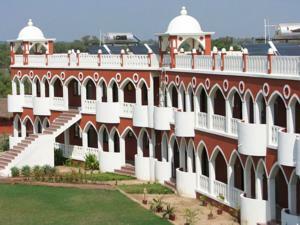 Set amidst lush green gardens, Aum Health Resort features an outdoor swimming pool, a gym and a herbal garden. 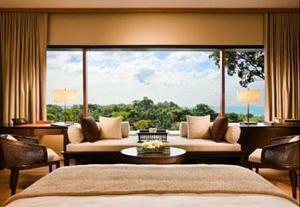 It also offers air-conditioned rooms with a balcony. Modern rooms come with tiled flooring and dark wood furnishings. They are fitted with a desk, fan and flat-screen TV. The en suite bathroom offers a bath or shower. Guests can relax at the spa with a massage or herbal treatment. The resort's herbal farm, Aushdhi Van, features various species of medicinal trees, herbs and aquatic plants. Free private parking is available. Aum Resort's on-site restaurant serves vegetarian local and Chinese cuisine. Aum Health Resort is a 15-minute drive from Ajwa Garden and a 45-minute drive to Vadodra City. Vadodra Domestic Airport is located 22 km away. Internet via modem is available in public areas and costs INR 100 per hour. Free! One child under 5 years stays free of charge when using existing beds. The maximum number of extra beds/baby beds in a room is 1. Any type of extra bed or crib is upon request and needs to be confirmed by management.